Denise and I drove the 850 kilometers from Melbourne to Sydney, and on the morning of the 30th. of August 2002 flew out of Sydney by Qantas, bound for Los Angeles. After 14 hours of deadly flying we touched down at LA at 0715 ( 7.15AM ) on the morning of the 30th. of August local time, actually arriving in America before we left Australia. We had an awful 5 hour delay before we could join Air Canada and fly on to Vancouver, we were actually booked in separate seats some 15 rows apart, and no entreaties to be seated together would move the incredibly rude Air Canada female dealing with our seats for this flight. We checked in at the Century Park Plaza Hotel about 2 PM, check in time actually 4PM, but the staff here were most accommodating and quickly found a room we could have immediately. On Saturday the last day of August, we taxied down to Canada Place and the Cruise Terminal, handed over our two cases suitably marked with our cabin number, the actual boarding routine very smoothly handled. At the gangway was the usual ship's photographic crew wanting to make the absolute most out of every couple and single person who were to join this cruise. We quickly brushed them aside not wanting to be involved with their photographic hype, " What no happy photographic memories for you?" A simple no thank you, hardly enough to deter them, but they did eventually get the message, as they were to do many subsequent times during the ensuing 7 days. Our cabin on Aloha Deck 11, was quicky located, all very adequate, a queen size bed, chest of drawers, desk, wardrobe, and bathroom with basin, shower, and toilet. TV and telephone, with the sea to shore rates at some outrageous price, and our own safe in which our passports, plane tickets etc were safely stored. Entrance to our cabin, gained through use of a credit type individually made card, which was used on board as the ship operated in a cashless environment. We had been informed by a brochure after we had paid our fare, that as the service on board was so wonderful, the P & O Company just knew we would want to award their staff accordingly, so to make it easy for all passengers, the policy was to debit each passenger's account on a daily basis US$10, including all children, to pay the cabin and waiting staff a gratuity. In addition, to pay the drink's staff, all beverages would attract a 15% loading, also in US currency, as this was the money on which the ship operated. We very quickly found our way around this quite remarkable ship. Built in Italy in 1998 at a cost of $300 Million. Gross registered tonnage: 77,499 tons. Draught: 26 feet 7.5 inches. Total height above keel: 185.4 feet. Thrusters: two at the bow and two at the stern. Captain: Tony Yeomans from England. We sailed at 1730 ( 5.30PM ) with the drinks staff absolutely desperate to flog off "Sailing drinks." which looked quite a ghastly colour, and were priceed at about US $6.50. It was also interesting to us, that Coca Cola were running a special promotion over the 7 day cruise. One signed up, and was given a special Coke container, which you could then refill as often as you wished for US$ 22.50. The Americans on board, and there were some 1,360 of a total passenger number of 2,062, were queued up to get this Coke deal. The ship boasted some 7 eating areas, including 2 top class Dining Rooms, the Horizon on Deck 12 which had food available in a remarkable range for 24 hours a day. One could order from room service in one's cabin at any time day or night, a bowl of fruit could also be called for in our cabin. Saturday night and all day Sunday we cruised at about 20 knots on our way to Juneau. The ship had the Princess Theatre, almost a full size theatre , seating perhaps 750 or so, this was the venue for Movies, or a live stage show, several of which were staged during our week on board. Another site, the Vista Lounge, was also available for live shows. By a careful choice of our evening dining time, we were able to take in both live shows should we so desire. We had chosen open dining by design, so that we had could control when we wanted to eat at night, and were not stuck with the same group of people each day, and likewise they would not be caught with us every evening. Tables were for 2, 4 or 8, we quickly decided to book a table for just ourselves for dinner, breakfast and lunch gave us enough opportunity to meet our fellow passengers. We were amazed by the number of people in wheel chairs on board, at least 50, and they always seemed to be getting in my way, as they just demanded right of way at all times. This is the capital of Alaska, a population of 30,000 spread over an area of 3,108 square miles, makes Juneau the second largest city by size, world wide, exceeded only by Kiruna in Sweden with an area of 5,458 square miles, information, I am sure you were just dying to find out. Joe Juneau and Richard Harris searched for gold in this area in 1880, and out of their discovery were to come three of the world's largest gold mines, and some $150 Million of this precious metal was recovered. We took the Juneau Tramway, which starts its brief journey to the top of Mount Roberts close to the docked ship. This tramway is operated by "First Nation people" who make an absolute killing out of brief tour, cost US$ 21.50, for about a two minute ride, but!! you may make as many trips up and down as you wish over the afternoon, I can assure my readers, once is very adequate. The township spreads over just a couple of streets, and really relies on the visit of cruise ships for its trade and I would think, its very survival. We sailed at 2055 ( 8.55 PM ) for Glacier Bay. We cruised in between islands covered with trees, can any country in the world boast of as many trees as does Canada, and of course Alaska. When one flies, drives, travels by ship, every where you can look, trees, trees and even more trees, of so many different shades of green, quite a wonderful sight. Early on Tuesday the 3rd. of September we enter Glacier Bay, the mountains reaching down to the channel, they are dark in colour, creased where eons of time have caused snow and ice to gouge out cracks, just like a well used old face. Waterfalls cascade down these areas, and many are capped with snow, it now early autumn or fall here, and before long, ice will close off these waterways, the pack ice is slowly starting to form, and from this photograph you can see how it is starting to form up ahead of our ship. The surrounding water, an amazing emerald type green or peacock blue, and we come up to the John Hopkins Glacier, glinting in the bright sunshine, ice blue as the sun’s rays pick out peaks, jagged, and pieces of ice breaking off to splash at it’s base, making ripples in the calm waters, to slowly fade away. The scenes quite unreal, and not possible to describe in mere words, in no way can I put down the scenes before our eyes, I have waited a lifetime to visit here, now at last it becomes reality, and I am not disappointed as vista after vista appear before me, all very enthralling. Sea Princess slowly moves along Glacier Bay, and our only real disappointment is the lack of wildlife here in Alaska, I should say our lack of sighting any, no whales, no bears, no seals, no otters, no porpoises, little bird life other than the usual seagulls, some 200 species of birds frequent Glacier Bay, but not today. The weather is quite superb, blue skies, lovely sunshine with a temperature about 18 degree C or 66 degrees F.
We come up to the Margery Glacier, and get close and personal, a few hundred yards away, it towers above our mighty ship, some 250 feet high and certainly a mile or more wide. Here we have nature exerting it’s superiority over humans, this Glacier standing supreme above this huge man made ship, dwarfed by this immense chunk of ice, shining in the bright sunlight, in all it’s glory, I am sure smiling deep within it’s heart, saying to itself, there, I easily beat you for size, beauty, and anything else you may care to name. I stand and stare in absolute awe at its forbidding size, and majesty. In this landlocked end of Glacier Bay, the ship being quite long in her length, I am suprised to watch how easily she slowly turns through 180 degrees, to position herself, so that we may lay our exit course, leaving the Margery Glacier, now on our starboard side, as we cruise on the outwards leg of this journey into this quite magnificent part of the Alaskan scene. 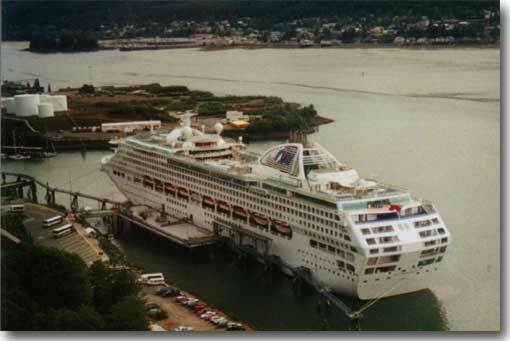 By 1630 ( 4.30PM ) we have cleared Glacier Bay and set a course for Skagway via the Icy Strait and Lynn Canal. It all began at Skagway in August of 1896, when George Washington Carmack and two Indian companions Skookum Jim and Tagish Charlie, found gold in a tributary of the Klondike River in Canada’s Yukon Territory. During that first year of the gold rush, up to 30,000 seekers of the precious metal streamed through Skagway and close by Dyea. It was not till the White Pass and Yukon Railway was completed in 1898, that Skagway consolidated its position as the Gateway to the Klondike. The hard part about getting rich in the Klondike was the task of physically getting there. The Royal Mounted Police looked at the thousands of tenderfeet seeking to traverse the Chilkoot Trail, and quickly decreed that each man would have to haul sufficient food to last for a year. That amounted to the horrendous quantity of 2,000 pounds, and it had to be back packed in, the most a man could cope with at a time, was 200 pounds. The most vivid image of those times, is a photograph of a seemingly unending line of black specks, inching up and over the mountain range. Men, nose to the back of the person in front of them, fearful of resting at all lest they lose their place in this endless line, inching forward a step at a time. Skagway still has the air of a frontier town, wooden board walks grace the street fronts, and many of the old wooden buildings carry the look of a distant past. Much of this, I guess, is contrived, for tourism is the life blood of most towns, dare I give them credence by calling any of these Alaskan places a city? The White Pass and Yukon Route. The reason this railway was built was simply gold. A few flakes found in Bonanza Creek almost filled a spent cartridge case from a Winchester rifle, but it acted as the trigger for the Klondoke Gold Rush. The initial track to the Upper Yukon was known as Chilkoot Pass, but it was just too rough and too rugged, a determined Sea Captain and trapper, William Moore was hired by a Canadian survey team to map the 141st meridan, the border between the United States and Canada. Moore headed over uncharted ground, over perilous switchbacks, up almost vertical hills, across canyons, until his party reached Lake Bennett, near the Yukon headwaters. Although this group arrived some days later than one which took the Chilkoot Pass route, Moore’s one showed promise of easing this trek into the Yukon territory, it was given the name of White Pass, after the then Canadian Minister of the Interior, Sir Thomas White. The story read: “ Sixty eight Rich Men on the Steamer Portland, arrived in Seattle with stacks of Yellow Metal, some have $5,000, many have more, and a few bring out $100,000 each. That of course only added to the fevered rush to get to Skagway, somehow scale the mountain passes, and cover the further 600 miles to get the prospector at the site where he may find his fortune. Intent on using pack horses, using the less steep White Pass trail, this untrained and mainly inept horde, overburdened the horses who to quote John London “ Died like mosquitoes in the first frost.” Over 3,000 horses perished in Dead Horse Gulch. A proper road was needed, and in the autumn of 1897, a former Northern Pacific Railroad engineer, one George Brackett built a toll road for wagons for twelve miles up the canyon. But alas, his toll gates were merely ignored, he ran out of money and this road was never completed. Now, in the early part of 1898, two men came north and met in a Skagway Hotel, both were intent on solving this transport dilemma to the Goldfields. Sir Thomas Tancred representing British financiers sensing opportunity here, and a Canadian Railway contractor, Michael J Heney. The former and his party, had looked at the mountains and thought them too rugged to give any chance of building a rail line to the head of the pass, but not so Big Mike, give me enough dynamite and “ I’ll build a road to Hell!” was his boast. In April 1898, the organised White Pass and Yukon Railway, paid Brackett the big sum of $60,000 for the rights to his failed road, in those times,an immense amount of money. His foresight having paid off for him and the intended railway in due course. This narrow guage rail way had its inception on the 28th. of May 1898. A narrow guage was chosen quite deliberately, it meant the tracks were but 10 feet apart, and less rock would have to be blasted keeping down construction costs, and a narrow guage required a smaller turning radius than did standard tracks. All the better to negotiate the tight curves of this route. Within but two months, four miles of track were completed, this operation was building the most Northern Railway in the Western Hemisphere. At Mile 16, Tunnel Mountain, one of the most difficult tunnels ever build had to be forced through the mountain, 2,700 pounds of black powder were required, and the subsequent blast was heard down below in Skagway. In all, some 450 tons of explosives were needed to be used blasting this line from Skagway to the summit. Heavy snow and temperatures falling as low as 60 degrees F below freezing hampered the ongoing work. The summit was reached on the 20th. of February 1899, and by the following July it reached Lake Bennett, and the beginning of the River Route. Sheer brute strength, and the rugged persistence of Michael J Heney drove this line through to fruition. This rail line has had a colourful history, in WW2, the railroad was the chief supplier for the US Army’s Alaska Highway construction project, and later has gained international fame as a tourist excursion railroad. An International Historic Civil Engineering Landmark. There are but 36 engineering feats world wide that have been awarded the distinction of being “ An International Historic Civil Engineering Landmark.” but the “White Pass & Yukon Railway” is one of them. It was blasted through the Coastal Mountains in the only 26 months, and it boasts one of the steepest grades in North America, from tidewater at Skagway the line climbs 2,865 feet, has cliff hanging turns of 16 degrees, and we must pay tribute to the intrepid workers who kept at it to produce one of the rail construction feats of the world. Denise and I took this one and a half hour rail journey each way, it trails over wooden trestle bridges spanning rushing mountain streams, tight curves that merely cling to the cliff edge as you look down into the gorge below, ever wondering how the rail cars and the labouring engines manage to stay on the very narrow guage tracks, without toppling off to crash many hundreds of feet below. One holds one’s breath as the train inches across the yawning chasm of Glacier Gorge, to suddenly disappear into Tunnel Mountain, 1,000 feet above the base of the deep gulch below. The Bridal Falls cascade 6,000 feet, emanating from glaciers on Mt Cleveland and Mt Clifford. You cross the border between Alaska and Canada, marked by a series of five flags, the United States, Canada, the United Nations, Alaska, and British Columbia, to arrive at White Pass Summit. The end of the current rail line, one may not get off, and the engines shunt into a siding so they may reposition at the original end of the train, to lead again for the downward journey, where constant braking becomes a neccessity for most of the return journey. Again breathtaking views are the norm, we arrive back alongside the ship very content with our journey. We knew we had ridden on one of man’s masterpieces of Railway construction, a true feat, with superb views, and the feeling that we could vaguely understand the trials, hazards, difficulties those early rail workers endured to build this incredible rail line over 100 years ago. Skagway remained to be explored as we walked into town, really one main street, with four Cruise ships in port, some 8,000 passangers swarmed like bees ashore to probe, seek out some bargain, the season almost over with but two more cruises to come before the cruise ships shut down until next May. Most of the shops displayed 50% off notices for all the stock they carried, and I sought out a carved Polar Bear from Star Marble, reduced by 50%, so I acquired my prize, packed in a nice blue lined wooden box, for US $12. We returned to the ship after seeking out the local Post Office to despatch some Post Cards home, well content with our visit to Skagway and the White Pass Railway. We sailed off to Sitka, coming to the port anchor in the harbour about 0700 (7AM ) on Thursday the 5th. of September, and will stay until 1300 ( 1PM ) when we will weigh anchor and start the southern journey back to Vancouver. To land ashore, this time we need to be transported in the ship’s boats, and a shuttle service is running on a continuous basis, the each way trip about 15 minutes. Sitka is a blend of both Indian and Russian heritage, it started as a major Tlingit Indian village, called Shee Atika, which roughly translated meant “ Settlement on the outside of Shee.” Shee is the Tlingit name for Baranof Island. In 1799, Alexander Baranof, was the General Manager of the Russian American Company, and he decided to move his base of operations from Kodiak to what is now known as Old Sitka, 7 miles north of the present day town. The Tligit Indians resisted this move, and in 1802 when Baranof was absent, they burned down the Fort and killed the Russian settlers. Two years later Baranof, returned and laid siege to the Indian Fort, the Tligits withdrew leaving the area once more in Russian hands. Now the Russians built a new city on a different site, naming it New Archangel. Over the next six decades, New Archangel was the Capital of the Alaskan Russian Empire, but by 1867, this colony in Alaska had become a great financial burden to Russia. The then US Secretary of State, William Seward negotiated with the Russian Czar to buy the Territory of Alaska for the US for $7.2 Million. Any Russian citizens living there were given the option of taking up American citizenship , many went off back to Russia, a few stayed or moved to California. Sitka remained the Capital of Alaska until 1906, when this status was moved to Juneau, a move directly resulting from the Gold Rush, Juneau had gold, and Sitka did not. But Sitka was not finished as a major area, after the Japanese made their sneak attack on Pearl Harbor, Sitka became a full scale Naval Base, and in WW2 had a population of some 37,000. After Japan was defeated, Sitka scaled down to a much quieter existence as obtains today, but the Alaska Lumber and Pulp Company in 1957 built a pulp mill near the city at Silver Bay. In July, Sitka will enjoy 18.5 hours of daylight, but in winter months this daylight is cut back to but 6.5 hours, and the area is very wet, 95 inches of rain cascade down annually upon the town. On Lincoln Street may be found St Michael’s Cathedral, a wooden structure which houses some priceless Russian Icons that date back to the 1600’s. In 1966, the Cathedral was destroyed by fire, the locals saved these Icons, and once again rebuilt the wooden Cathedral in an exact replica of the original. Standing close to the Sitka waterfront in a park, is a very large Totem Pole. Contrary to early belief, Totem Poles were not carved as monuments to Gods and were never worshipped by the Native people. They carried likenesses to ancestral symbols such as the Eagle, Raven, Bear, Whale and the Wolf, and told the story of heroic deeds making them a family tree or history in the truest sense. Often they were erected during a Potlatch, a large and important gift giving ceremony to honour the dead or remember an important event. During these celebrations,which could extend over several days to several weeks, gifts were given to guests according to their importance. The Totem Pole is not really an ancient art form, the large red cedar poles are very largely a 19th. century creation, and were produced with chisels, steel axes, curved knives and other metallic tools introduced by the European settlers. We took a twin hulled catamaran back to the ship, it was carrying many more passengers than were the ship’s boats, someone reported sighting a whale with her calf cruising Sitka harbour when they came ashore, but no! we were not lucky enough to sight this pair. We recovered all the lowered boats, weighed anchor and sailed for Vancouver, this took us until early on Saturday the 7th. of September when we docked at 0700 ( 7AM ) at Canada Place. In all we had sailed about 2,000 nautical miles in this ship. Our main baggage needed to be packed and outside our cabin the evening before our arrival. We disembarked according to the colour of the tag placed on our luggage, quickly went through Customs, no trouble at all, grabbed a taxi and made once more for the Century Plaza Hotel here in Vancouver, our home in this city. Again we arrived very early at the check in desk, but again the staff most accommodating, and our room was made available some 6 hours in advance of the normal check in time. Being in front, we chanced our arm, and asked if we might leave one large case in the Hotel’s luggage storage whilst we were away on the Rockies train journey, again success, we were warming to this hotel, and their pleasant responses to our requests. Denise took on the task of deciding what we would take, and what we would leave in the case to be stored, and we needed to be at the Vancouver Train Station at about 0600 ( 6 AM ) the next morning to get our tickets, details etc for the 2 day Rocky Mountaineer Train journey to Banff. Sunday the 8th. of September found us aboard the Rocky Mountaineer train en route for Kamloops in about the centre of the Province of British Columbia. As we left the city limits and crossed the Fraser River the sockeye salmon had started their run that would take them hundreds of miles up this river, into the Thomson River to the head waters where they were hatched some years earlier. The seals had found the salmon and were already harrying them at this early stage of their long journey. He also explained that the salmon have a tough journey ahead of them, the First Nation People in their different tribes, have various tracts of the rivers assigned to them, and each family will have fishing rights that will be handed down from father to son, the local white population may apply for a fishing permit, but each day have to report their catch, and dependent upon the quantity of fish available, they will be told if they can again fish the next day. The local bears wait for the salmon to run, they want to fill their bellies with fish to keep them going over their winter hibernation. Next in line are the bald eagles, they wait on the river banks for their chance to bag a salmon to take back to their nests, which are usually about 2/3 of the way up a large tree. Then of course come the Osprey or Sea Eagles, they build a nest on the very top of a tree or seem to like the top of Telegraph poles, they retain the same nest and the same partner for life. The Osprey is the only eagle to fish, they swoop upon the swimming salmon to grab it in their talons and then return to their nest. Sometimes, the salmon they select is too large for them to lift, they are not able to release their talons unless they can rest the catch, in such a case, the salmon will drag the Osprey under the water and the bird will drown. Years ago I remember reading a book called Salar the Salmon by Henry Williamson, it was the life story of a salmon from hatching until he made the journey back from the sea to his birth place, to spawn and then die, I would like to revisit that story when I get home again. When the salmon do reach their head waters, the hen will dig a hole, lay some eggs, the tom will fertilize these eggs then the hen moves up stream, digs another hole which lightly covers the first eggs and the process is repeated until all of the 4,000 eggs are laid and fertilized. His body turns red in colour, his head turns green, his task in life now completed, he will die, his partner, the hen also dies, really quite dramatic and tragic in its way. Out of the 4,000 eggs laid by each hen salmon, only 2 will grow, to reach the sea and return to their birthplace to repeat the cycle, all others will some how fall by the way side. I think the salmon life cycle, and story, is a truly amazing and interesting one. Simon Fraser was born in Vermont in 1776, the youngest of 8 children, and when 16 he joined the North West Fur Trading Company as a clerk, and by 1805 had become a shareholder, and was given the task of extending the Company’s interests west of the Rockies. He founded the first trading post at Fort McLeod, to trade with the local Indians. He now sought a navigable waterway west to the Pacific Ocean, and came on the junction of the muddy waters and the clear waters now known as the Fraser and Thompson Rivers. It was Fraser who named the Thompson after David Thompson, a geographer, and of course he needed to return the compliment, and named the Fraser after his friend Simon. The Fraser expedition travelled in the main overland, at times inching their way along the now named Fraser Canyon, and he suddenly came upon a very turbulent stretch of rushing water, the cliffs both sides closed in leaving but a very narrow gap, the river rushing off to the sea, boiling as it forced its way through this area, now named Hell’s Gate. As the journey on the Rocky Mountaineer is made in daylight so that none of the spectacular scenery is missed, we overnight at Kamloops, which literally means “ Meeting of the Waters.” the joining of the Thompson and Fraser Rivers. We make Kamloops about 1700 ( 5 PM ), and the last time we stayed overnight here a few years ago, the Motel accommodation provided in our fare was barely moderate. Buses await us at the station, an overnight bag being carried as the heavy luggage is not available until our final destination tomorrow. The Motel this time, was fine, but we need to board the bus to return us to the train at 0700 ( 7 AM ) in the morning. Of course the French contingent were unable to locate the elusive Moose, but it kept them quiet for some time. The scenery is magnificent, we run close by the Kicking Horse River, and the colour of the river is unbelieveably blue, waterfalls rush down the mountainsides, and the Trans Canada Highway, ( the second longest in the world, only Australia boasts a longer National Highway ) often closely follows the rail line. During the first 22 years that Canadian Pacific Railways operated this line, the Big Hill was a problem, a 8 mile or 13 km stretch of the line between Field and Hector in British Columbia. It had been built in 1866, supposed to be a temporary line until an alternative was found, it had a dangerous 4.5 % grade, and cost a fortune to maintain. Another route became mandatory, and in 1907, the Spiral Tunnels based on the Baischina Gorge Tunnels of Switzerland were started. 1,000 men toiled over the next 20 months, involving moving 750, 000 cubic yards of rock, and costing more than a $1Million. This work did reduce the grade to a more manageable 2.2 %, a Lower Spiral was driven through Mount Ogden, it ran for 922 feet, turned the line through 230 degrees and emerged 56 feet higher than at its entrance, the Upper Spiral was forced through Cathedral Mountain, running 3,255 feet, changing the line through 250 degrees, and emerging 50 feet higher than its entrance. We continued our amazing train ride to arrive at Banff about 1900 ( 7 PM ) collect our bag, and taxi into town. If the room had not been paid for, we would not have waited, in due course a quite surly man appeared, we got a key, took the old lift, which needed the key to operate it, but we did not know that at first. Our first floor room quite small, and all in all barely adequate, one light did not work, the bed lamp we eventually discovered to switch off necessitated getting out of bed, and using a switch by the door. Next morning, check out time was 11AM, we were all packed, but at two minutes later, a knock on the door, and we were informed we should be out of the room. On opening the door we were confronted by a different man than the one we met the night before, we requested that our bag might be stored, as our bus for Jasper did not leave until 3 PM , we don’t usually store luggage was our gruff response, but some pressing on our part did get a reluctent OK, but be back for it by 2PM. He went for our baggage, grizzling all the time, and when it did appear, said “ Next time you come, don’t expect us to store your luggage.” My response was “ Do not worry , we will never be back here again, and in my 60 years of travel I have never met anyone quite so rude.” With that we swept out, and went across the road to await our Brewster Bus for Jasper. This bus trip an absolute delight, we stopped at the famous Chateau Lake Louise, where we had previously stayed, but the costs this time very expensive with our very weak Aussie Dollar, then off to the Columbia Ice fields and a stop at the Athabasca Glacier, wonderful sight, as is the whole drive to Jasper along this great highway. Many motor homes are on the road, the only trouble they seem to drive very slowly, and our bus driver had a real task to pass them at times. We arrived at Jasper and were dropped off at our hotel. Today is the first anniversary of our visit to Washington DC last September, and the horrific plane crashes into the World Trade Centre and the Pentagon. On that day we were due to fly out of Dulles Airport on the ill fated Flight No 77, only at the last moment were Denise and I taken off that flight so we might join our Australian Prime Minister on his planned visit to Arlington Cemetery. All day, the TV stations have revisited the events of this day one year previously, and we were drawn to the screen to again observe those events, to see that AA Flight crash into the Pentagon. On this occasion, I was far more conscious of the fact that we were so close to being on board and dying, than I was a year ago. I found myself profoundly affected by it all. To break this mood, we went off to take the Jasper Tramway, in eight minutes it whisks you to the summit of Whistler’s Mountain, almost 8,000 feet above sea level, with the town of Jasper magically spread out below. Views of the Rockies over six mountain ranges, lakes appearing like emeralds strung on a long necklace, rivers meandering across the landscape, all in all, a truly wonderful vista stretching out as far as one’s eye can see. My black mood was broken, how could one contemplate one’s demise in such an environment? The tram car actually moves at eight metres per second, and fairly whistles up and down its 44 mm traction rope, this whole attraction built over an 8 month period by a German Company. We were taking a bus to Edmonton, so that we could fly back to Vancouver after an overnight stay, and then go off to LA and home. The Brewster Bus Company does not ply the Jasper/Edmonton route, and we were forced to use Greyhound, our second mistake in a short time. Leaving from Jasper at about 6AM, we were lucky to find a seat, all types of human beings sprawling over seats on its arrival, having emanated from another city, we were faced with 5 dreary hours, stopping briefly at a sleazy roadside cafe. We were pleased to eventually drift into its Edmonton Bus depot, our Hotel Fantasyland, set in the world’s largest Shopping Mall, and the largest Amusement Park under cover any where to be found. Neither of these World Record Breaking phenomona giving us much comfort, particularly as we had unknownenly passed this site on our way in, via the bus, and it was now a $50 taxi ride to return there. We wandered this amazing 800 or more retail outlets mall, and the amusement park, thinking it all looked a little tired, and the shops the same the world over, offering their exclusive labels etc. September 13 found us flying with Air Canada from Edmonton to Vancouver, the aircraft’s air conditioning not working, on several occasions Air Canada flights had some problem or other, they have a monopoly on flying within Canada being the one and only domestic carrier, so you put up with what you get. This meant we were restricted to the height that we could fly, it turned out to be a bonus, we flew much lower and had a quite wonderful view of all the Rockies, one could pay heaps to gain the same experience in a charter jet. Sometimes, good commeth out of seeming adversity! On arrival in Vancouver back to our home the Century Park Plaza, we recover our case, and Denise repacks for our journey home tomorrow. We leave Vancouver on the 14th. of September, book our bags through to Sydney, offering up a silent wish that they will appear at Sydney on the 16th on our 6AM arrival. We are now faced with almost 20 hours before that happens, and prepare to go into a type of coma, as we fly to LA, negotiate that quite difficult airport to find Qantas, and settle down as we fly non stop across the Pacific home. Monday the 16th. of September. We arrive on time at 6AM, a quick visit to the duty free shop, yes! our bags do appear. Sniffer dogs are in action, and one stops close by us, sniffing at someone’s hand luggage, sitting alongside the bag, unmoved until rewarded with a treat from it’s handler. I have declared my wooden box containing my carved Polar Bear, any timber entering Australia is subject to Custom’s scrutiny. My book, Hitler & Stalin Parallel Lives, attracts more attention than does my wooden box, the Custom’s Officer wanting to talk about Hitler, we had trouble getting away from him, no problems with by box and Polar Bear. We taxi to Lane Cove and Denise’s apartment, shower, and tumble into bed, we have lost Sunday on our way west over the International Date Line, and it is Monday morning, our saga over, we achieved our ambition to do the “ Inside Passage Cruise” and “Return to the Rockies.” it is good to be home again, but we have enjoyed our journey immensely, one always expects the odd difficult moments, but we are pleased we made this trip. Don't forget to look at the pictures.